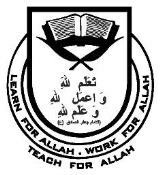 The Haydari Madrasah Nairobi has the pleasure of inviting all Madrasah Parents of KG – Graduation Class to participate in the Annual Parent / Teacher Consultations (PTC) on Sunday, 10th February 2019 from 9:30 am to 12:30 pm at the Madrasah. Alhamdulillah, the Madrasah has begun the roll out of the World Federation Madrasah Center of Excellence WF MCE Tarbiyyah Curriculum. We have at this halfway mark, completed 4 out of the 8 modules. The students mid-year reports will be sent to you via email. Kindly inform the Admin office with your updated e-mail contacts if you do not receive your child's report by Friday. The Admin office can provide a print copy for your review. We strongly encourage all parents to come and interact with their child's respective teachers. This is an ideal platform to meet with individual teachers and discuss your child's progress. It is our humble request that each session be kept to a maximum of five minutes to allow all parents an equal opportunity to meet the teachers. If for any reason, you feel that you need to talk at length with a particular teacher, you are welcome to make an appointment at a mutually suitable time. Please find below link for the amended 1440 Year Planner. Thank you for your kind cooperation always.